However, you can obtain a candidate by this method, the question is did you find the right person? Instead, we should strive to trust our ‘’fingerspitzengefühl’’ more often. Little dictionary moment! Fingerspitzengefühl is originated from the German language and can be defined as an intuitive feeling to act in delicate matters or under difficult circumstances. You can also describe it as instinct, gut feeling, intuition or unconscious knowledge. Not to confuse with judgements and assumptions! Hospitality recruitment managers must know how to combine intuition with the ability to analyze, asses, synthesize and evaluate, as well as involve quantitative scientific tools, which contribute to understanding what is not seen at a glance. Finding the ideal professional for your hospitality position is complicated. The reasons may be lack of experience, unqualified candidates or insufficient people to choose from. Some hotels even have periods with constant staff turnover because it is difficult for them to locate the right collaborators and to keep the employees happy with their work and their remunerations. We, fascinated by this phenomenon, want to give an insight into how you can catch your fingerspitzengefühl. You can discover the 7 essentials about how you can hire the best employee for your hotel business. Interviewers dominate the conversation when they are eager to recruit. This leaves less space to genuinely meet the candidate. When the candidate arrives, make an effort to listen to their story, their life at home and their personal interests. Act as if a psychologist without a license. Hire people who walk fast. Meant as in people with high energy, typical go-getters. People like this tend to have a sense of urgency about life and a great predisposition to take action. Someone who is efficient in their work so they can quickly obtain a solution when problems occur. 5. Ask them to practice! Include daily simulations as part of your interview process or invite candidates to offer you their best jobs and ideas. Not like: ‘’How many golf balls fit in this room?’’ or ‘’ Sell me this pen.’’ For example, select 2 cases/problems within your hotel to see how the candidate digests the info in their brain to produce an agreeable solution. Look carefully at the strengths and skills that are lacking in your team and go for the qualities and styles that can add value to your team. 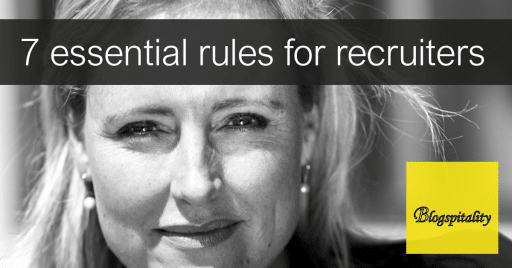 7 essential rules for hiring in your hospitality business. Free to download. The candidate who cannot laugh easily, especially of himself, will be very serious and probably intransigent. Laughter brings a positive ambience on the work floor and increases engagement towards colleagues and guests. Funny fact: Fabiola Sala wrote an article in Harvard Business Review about the positive correlation between humour and received bonuses by executives. Next time in the boardroom: laugh! It might be contrary to your intuition but: do not hire someone like you! People tend to hire themselves unconsciously because they have a feeling of similarity. In the end, they discover out that it is not always easy to handle people who are like them. Companies as such try to look in corners of change management, culture change and diversity enhancement to solve this issue. Teaching skills are nothing compared to transmitting the right attitude. Among the candidate’s qualities, what he should look for most is a firm sense of optimism. Experience comes with time, qualification can be taught, but the right Let’s Kick It attitude is gold for success. Your company legacy will be built; by the teams you choose! Applying these 7 rules is essential. However, after following procedures for so long it can be difficult to spot the sense right away. In our 20 years of existence, we know when the fingerspitzengefühl is just about right! By understanding the business culture as a whole and knowing the characteristics of the candidates we help the hospitality business to find the right manager or director. Hospitality recruitment. Since 1999. Experience the thrill of the perfect match! Share your tips, tricks and insights! @blogspitality and join the conversation.